This Apple Chicken Recipe is so delicious. 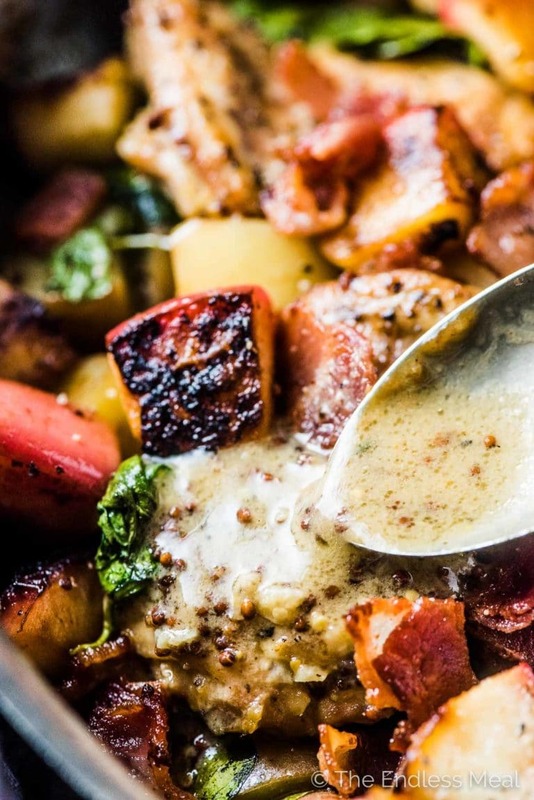 It's made in one pan with bacon, potatoes, spinach, and a simple honey and grainy mustard sauce. 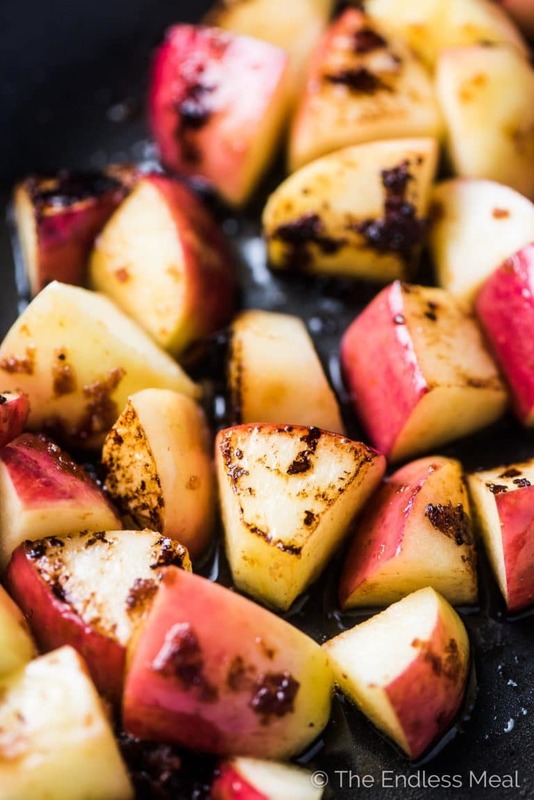 It's an easy to make and healthy recipe perfect for apple season! Want an easy and healthy dinner recipe that's packed full of flavor? I thought you might! 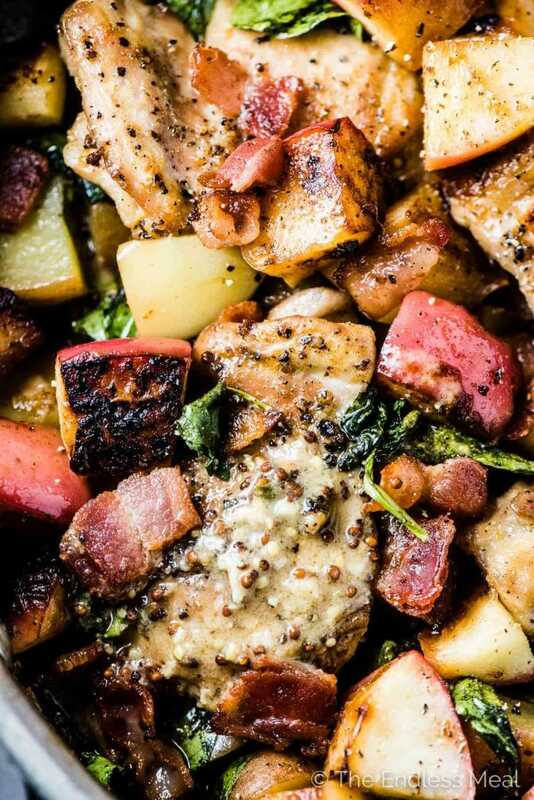 This apple chicken recipe has become one of our favorite new chicken recipes, and I think it's about to become your fav, too. Apples add just the right hint of sweetness which goes so well with chicken. Sweet, crisp, BC Ambrosia Apples. ← these are my personal favorite apples. Bacon. Because bacon makes everything better. One pan easy. 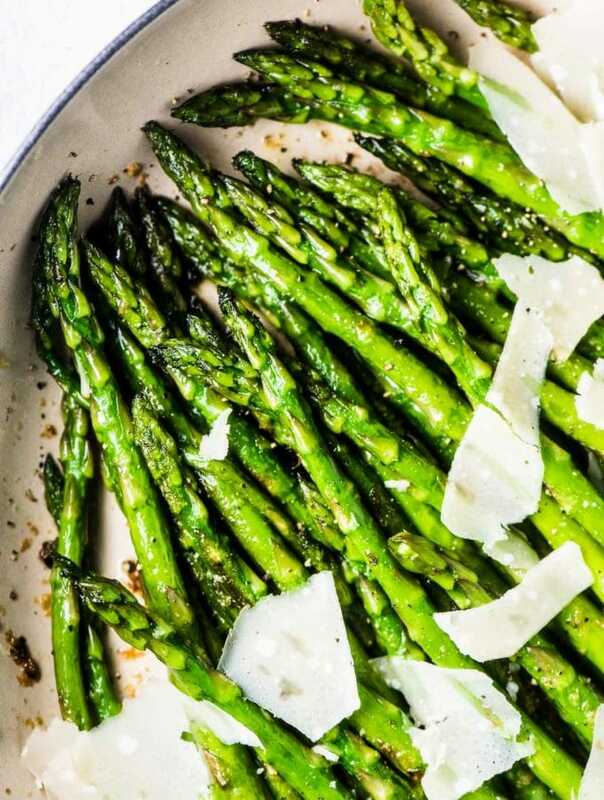 Love simple dinner recipes! 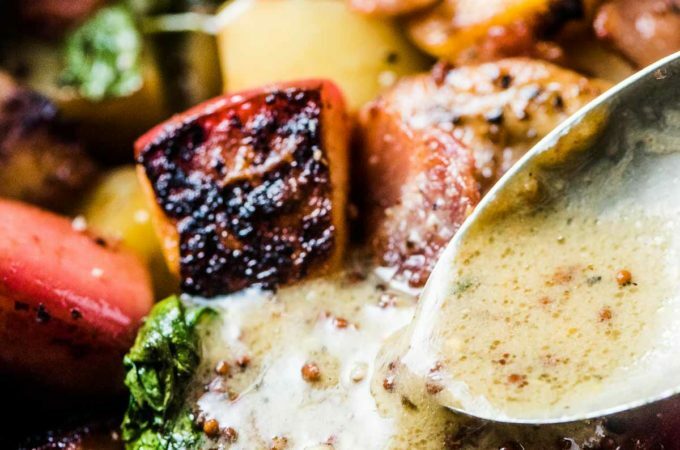 A light honey mustard sauce that becomes creamy from the potatoes. 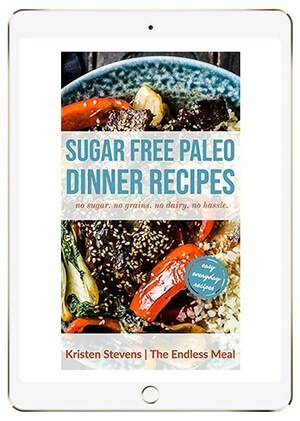 It's a healthy, gluten-free + paleo + dairy-free recipe that is so delicious you'll never notice it's any of those things. See those apples up there? They are my all-time favorite apples. They're BC Ambrosia Apples and they're sweet and super crispy. They're perfect for baking and cooking AND for snacking on. As they're slow to brown, I often slice one and pack it in my daughter's snack for daycare. When I buy Ambrosia Apples I always look for the BC Tree Fruits sticker leaf. (You can see it on one of the apples in the picture.) It's how I know I'm buying premium quality apples. BC Tree Fruits farmers are a cooperative of over 430 families that live and grow in the Okanagan Valley. ← That's where I grew up, running around my grandad's orchard. When you purchase apples with the BC Tree Fruits leaf, you are supporting your community. 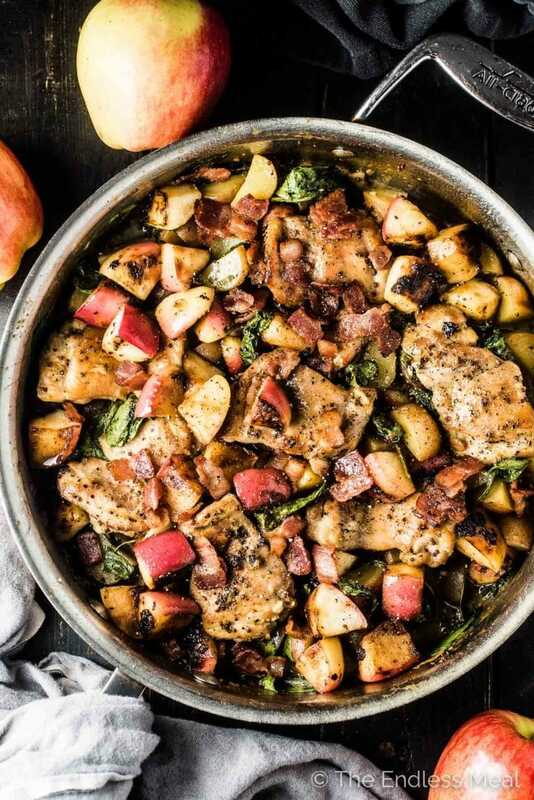 Once you have your BC Ambrosia Apples in hand, this apple bacon chicken skillet is almost yours. Start by crisping the bacon. Then try not eat all the crispy bacon before dinner is ready. Good luck! Then add the chopped apples to the pan to caramelize them and give them some color. Now it's the chicken's turn. Give it a quick sear so it has some color, too. Now add the simple sauce ingredients and the potatoes and pop the pan into the oven. Easy! 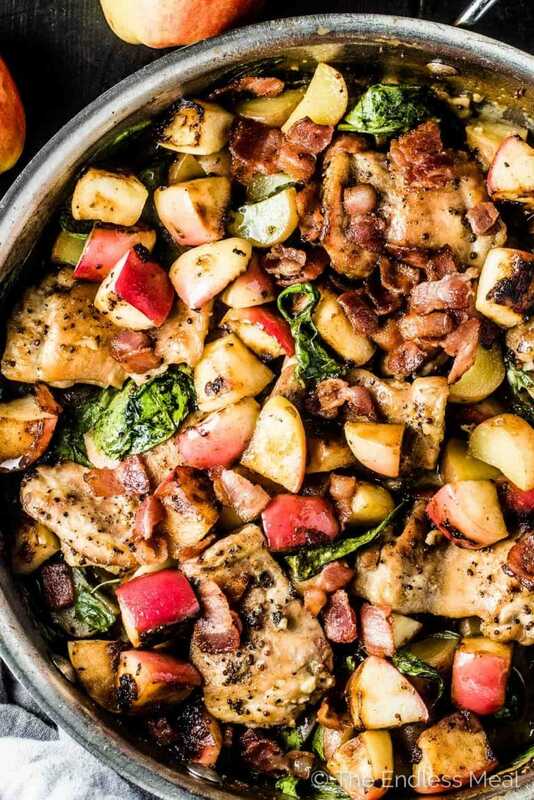 When the potatoes are soft and the chicken has cooked through, scatter the bacon, apples, and spinach around the pan then pop it back into the heat for a few minutes to wilt the spinach. Apples emit ethylene, a naturally occurring gas that ripens fruit. If you have an unripe avocado, stick it in a bag with an apple and it won't be long until you can eat it. 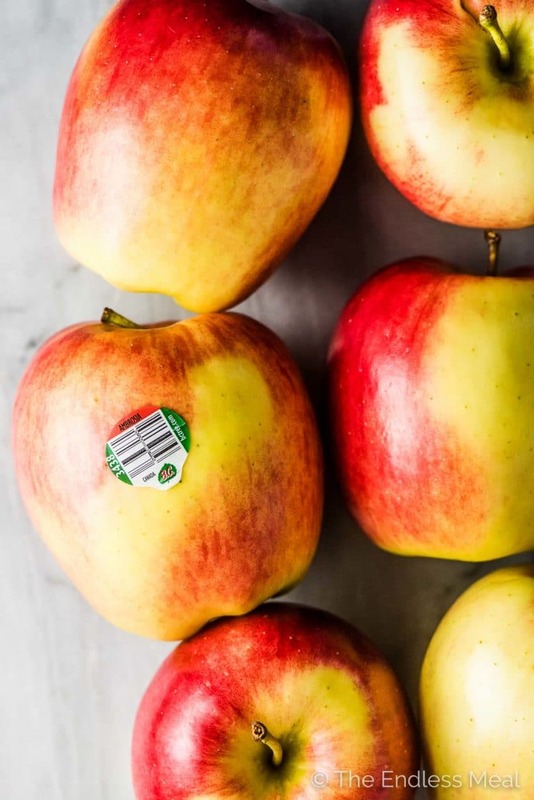 But if you don't want to ripen fruit, keep your apples in a bag away from other produce. Did you know that apples are easier to peel when they're cold. But only peel them if you have to as most of the nutritional value is in the skin. Apparently, a plate of apple slices on your kitchen counter will help absorb cooking odors. Did you know that? I just found that out! For more info and fun fact on BC Tree Fruits, follow them on Instagram, Facebook, or Twitter! Cook the bacon in a large, ovenproof frying pan over medium heat until it's crispy, about 10 minutes. Remove it from the pan with a slotted spoon. Delish! Made this for the first time last night and it will definitely become a regular Sunday meal – making plenty for lunch the next day. I used organic boneless/skinless chicken breasts pounded out, which helped reduce the calories per serving. 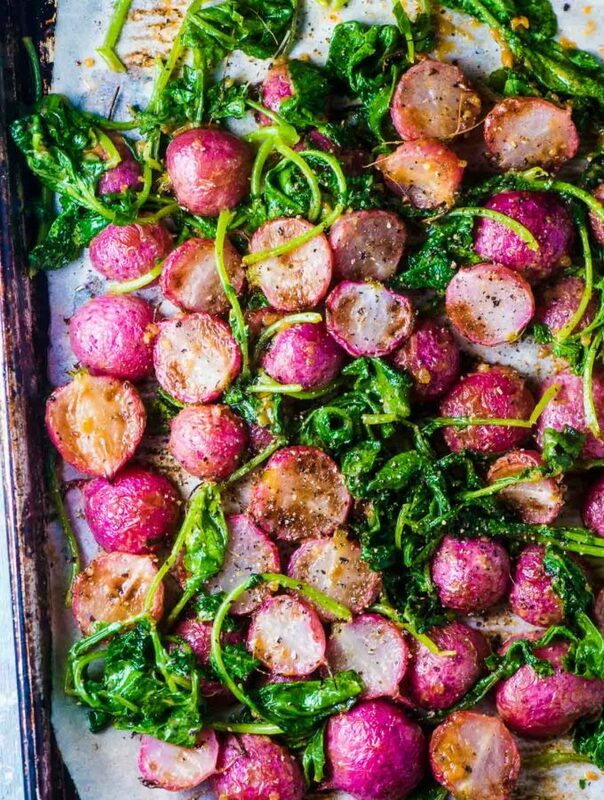 I also boiled down the sauce on the stove top before the last 5 minute bake, wilted the spinach at that time and then threw in the oven under a low broiler – the sauce was way too watery following the instructions and I wanted a little crispness to my potatoes. Turned out so good! Love your recipes!! You’ll find it in the cold beer and wine stores and liquor stores! I’m so happy to hear it turned out! Hooray! Am just now preparing this for dinner; but I cannot see the oven temp anywhere. I’m guessing it’s 350. That’s what I’m going with, anyway. I cooked this at 375. I’m so sorry for missing that important step!! Love your recipes! Thanks so much for sharing. I frequently pass them on to my co-workers and they love them too! Question about the above; the two ambrosia apples, diced, are listed twice, but only one set of cooking directions for them. Should four apples be used? Nope, just 2 apples. The second time you see them in the directions is when you add them back into the dish along with the bacon. Sorry for the confusion! 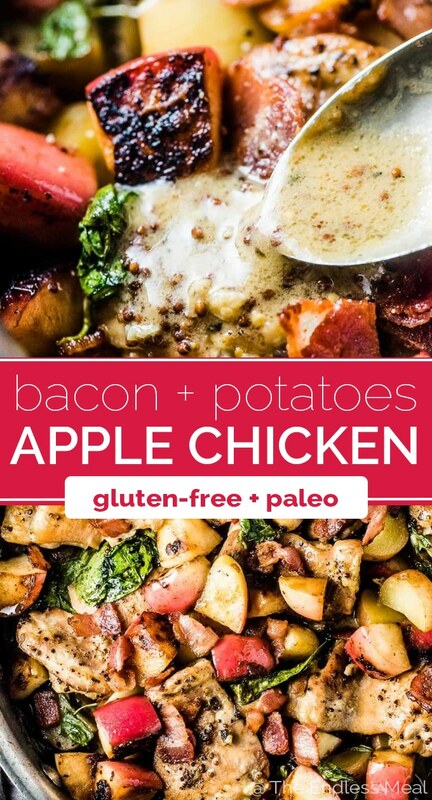 I’ve never had chicken with apples, but chicken and bacon are best friends, and bacon and apple get along so well that I can’t see why they all can’t live together in peace. I’m in! Oh they do get along great!!! What an amazing combination of flavors! Love everything about this dish. Apples are such a great addition to savoury dishes! Thank you! I love them, too. They’re such a versatile fruit!